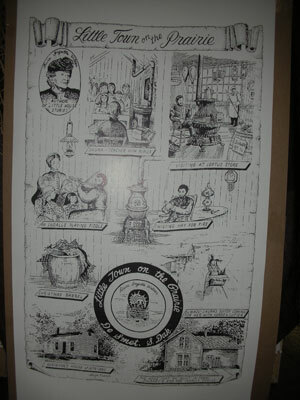 A selection of items from The Loftus Store. Advertising Suspenders. "As most of you know, the Loftus Store is where Laura, Mary and Carrie found Pa's Christmas suspenders. They were the prettiest ones in town. They were blue with red flowers." 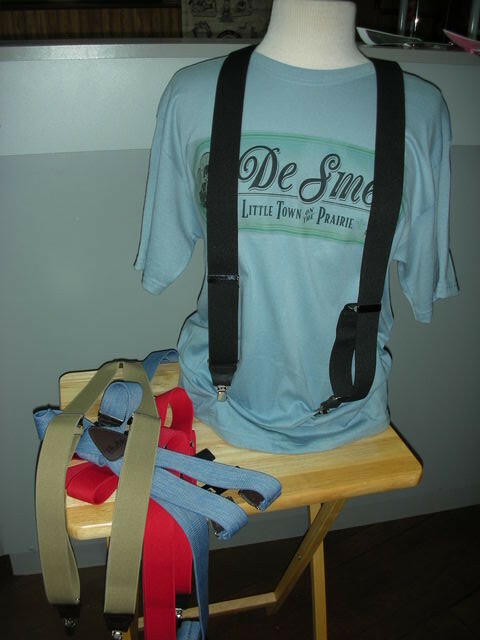 We now have suspenders for men and boys. Images of America De Smet - Book. This book is all about De Smet and its rich history. 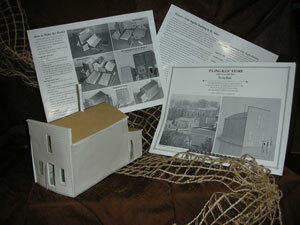 2 Local De Smetites took their time and combed through many piles of pictures to put this booklet together. If you love De Smet, this is the book for you! Wall Decor (On the prairie). Here is a really cool wall decor item for your Laura collection room. Use a branch or a piece of rusty metal and a couple of drawer pulls to hang it and you have a unique piece of wall art. 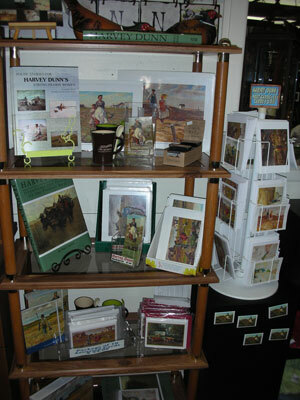 Hanging in the Loftus Store is the original painting by Ron Becker and available to you are prints for $70.00 and notecards for $7.99. This was the first church in De Smet, one that Pa Ingalls started and the origional church he built still stands today. These tried and true recipes come from the heart of the De Smet Community Church congregation. 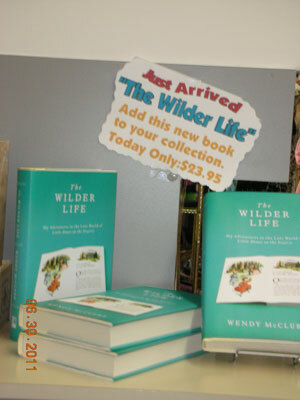 It is in it's second printing and a portion of the sales from this book goes back to the church for mission projects. The cookbook is available for $15 and $3 shipping and handling. Custom Stationery, note pads, coloring books, recipe cards, magnetic pads, collectible spoons, mugs, lapel pins and charms. Key chains, letter openers, pocket knives, shot glasses, tree ornaments and pencils. 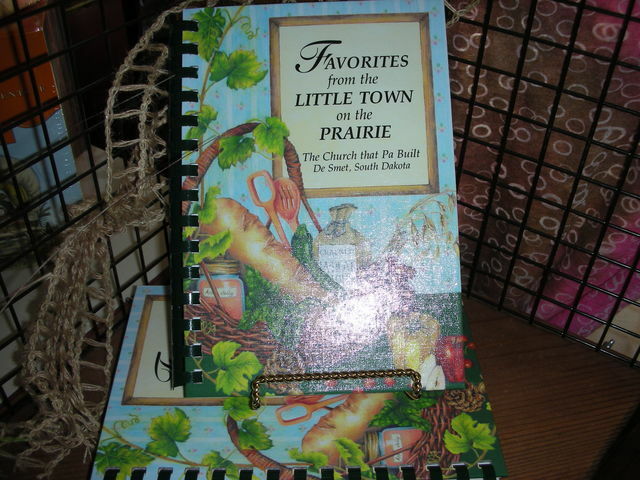 Also we have sewing kits, bracelets, bells and necklaces, all with the Little Town on the Prairie, De Smet, SD insignia. Old fashioned stick candy, rock candy, horehound, and lemon drops. Are you looking for Jack the bulldog, or Susan the cat? We have them for only $8.99. Besides the basic collectible souvenirs, we at the Loftus Store pride ourselves in finding NEW collectibles or maybe you as a tourist has said "do you have this or that" and we make a point to search out your suggestions and find some great new stuff. This year we have added a line of home decor accessories such as coaster sets, trivets, aprons, towels, cloth bags, pot holder, wine bag and pillows. Check out our neat lasered rocks for your rock garden, or the ceramic tile you can work into your kitchen. How about the glass embossed block you can put your smaller cherished LIW keepsakes in. The perfect gift idea for your Laura fan that has everything else!!!! A couple of really cool mugs that look like they are made of marble. Check out the antique looking lantern. Wouldn’t that just set off a Laura display. The ceramic tile is a unique piece to have. Simple bonnets to complete period dress ensembles all made locally to fit a baby, young girl, or lady. Calico prints may vary. 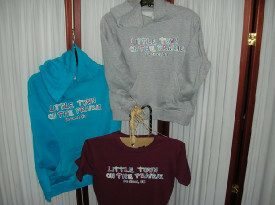 We have girls' sizes (sm., med., & large) through adult ladies sizes. Special sizes can be made to order. Please allow 6 to 8 weeks for completion. 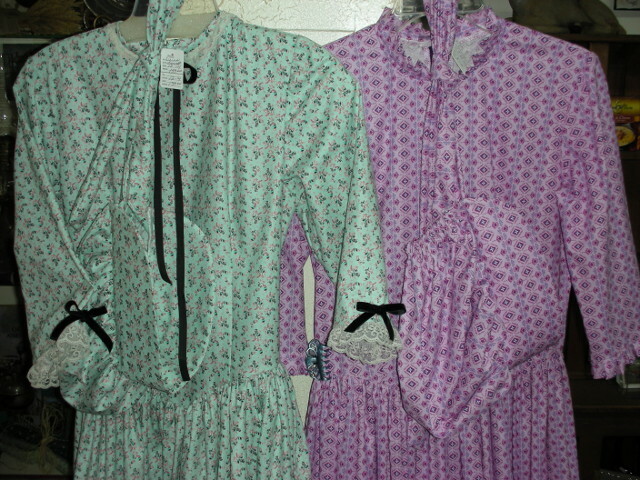 Prices for a single bonnet start at $17.00 and the little girl complete prairie dresses with matching bonnets start at $83.00. 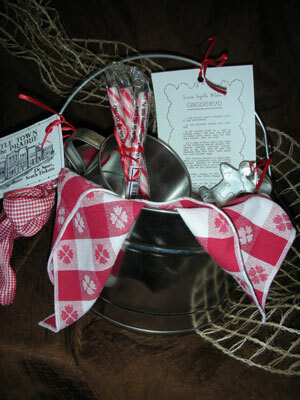 Also available is our matching bonnet/apron combo for $35.00. Our Charlotte Dolls are hand made from the tips of her toes to the top of her head. She is made by the description in the book. There are several colors to choose from and those colors may differ as to what the picture shows. Cost $39. You can own a piece of the original Loftus Store that Pa help build. We salvage the wood when renovation was being done. A five inch piece of wood is only $8.99. 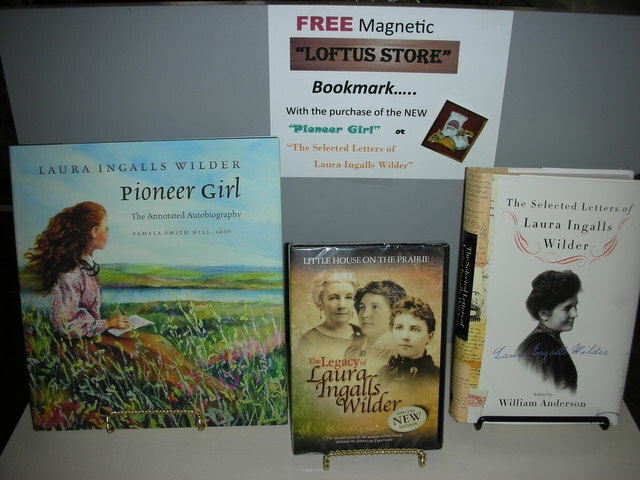 We are featuring 2 NEW books, the Pioneer Girl which came out in 2015 and the newest book, Only $39.99 and "The Selected Letters of Laura Ingalls Wilder" by William Anderson which came out in the spring of 2016, Only $26.99. 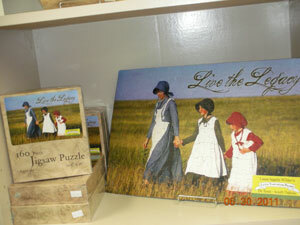 We also have the DVD The Legacy of Laura Ingalls Wilder. It is a one hour documentary that goes beyond the scenes, true life story of the famed author Laura Ingalls Wilder. Step further into Laura's world with 35 minutes of bonus footage of behind the scenes with director Dean Butler and Illustrator Cheryl Harness to experience the making of this amazing DVD. Only $20. 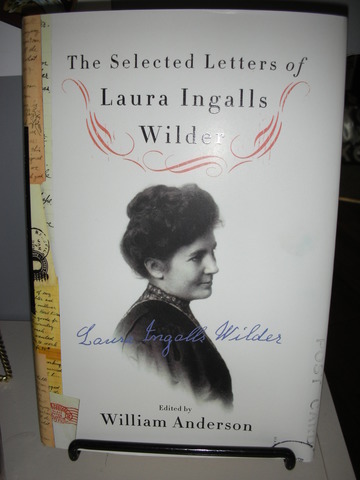 Looking for a book written by or about Laura Ingalls Wilder? We have several. Boxed sets, individuals, hard and soft cover. 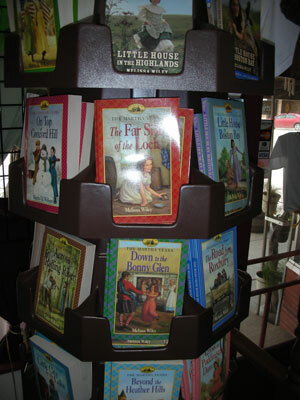 We have Caroline, Martha, Rose, and Charlotte books. Laura's Album is here too. If we don't have what you are looking for, we know where to get it. Available nine book series in full color and glossy white pages with crisp clear wording. We've added three new books available for sale. "Pioneer Girl Perspectives Exploring Laura Ingalls Wilder", "Prairie Fires", and "The Selected Letters of Laura Ingalls Wilder". Please contact us if you would like to order one of these books or any other products on this page. 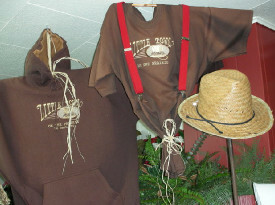 We have the largest selection of t-shirts and sweatshirts in town. 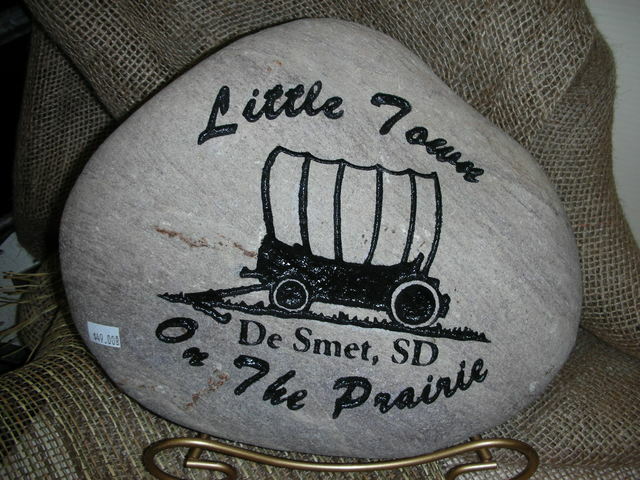 A brilliant variety of colors with a rainbow print of a covered wagon embossed with Little Town on the Prairie, De Smet, SD available in sizes youth 2/4 to adult 3X. 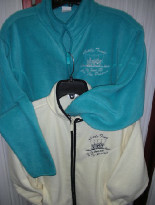 How about an embroidered t-shirt or sweatshirt. It is enhanced with stick lettering that spells out Laura Ingalls Wilder, De Smet, South Dakota, and is accessorized with a bonnet, small horse heads, covered wagon and a sod house. Something really unique is a shirt that changes color in the sun. It is black and white indoors and turns colored out of doors. The scene is a prairie picture. Be sure to check out Laura's favorite corner. The candy cupboard. 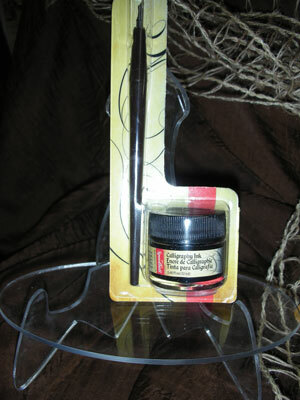 We have the peppermint candy sticks along with other flavors. Remember the books talking about Horehound candy, well, we have it. We have also expanded into some of the nostalgic candies. Check out the flavored gum and mints. 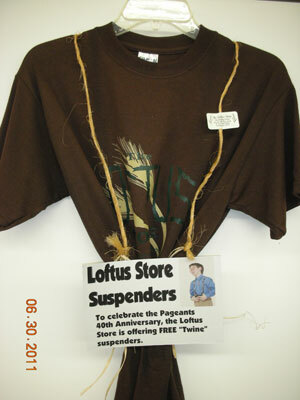 If you have any questions or would like to place an order, please give us a call at 605-854-3773.